Mood board: The M.O. 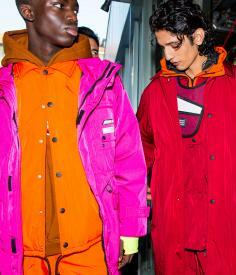 at MSGM is fast paced – racing towards a bright, pop future. Its founder Massimo Giorgetti has a penchant for speed. Last season guests were sent water-bottles ahead of the show, held on a volleyball court to introduce sporting separates as a key theme for the brand. This season the invitation was a baseball cap with the word ‘Turbo’ embroidered onto it and a quote from former race car driver Mario Andretti: ‘If you have everything under control, you are not going fast enough.’ These are jubilant clothes for buzzy city bees. Sound bite: Motor racing culture met with an Italian post-punk line. Cotton jackets had allover flame prints. Washed denim cargo pants were cut wide influenced by pit crew uniforms. Motorsport newspaper stories were printed onto striped shirts and a smart camel coat. ‘MSGM is evolving. Speed has always been at our heart, the fast passion of life. What do we do as we grow? We go faster,’ Giorgetti said. Backstage the mood board included close ups of car headlights, black and white photographs of cars in motion and energetic scenes from 1980s Japanese football cartoon Holly & Benji. These appeared as a jacquard on a half-zip pullover and a classic trench.